Whenever breed restrictions or bans are proposed, those arguing for discriminatory policies rely on this false idea: that “pit bull” dogs are uniquely different from all other dogs and that they are uniform in their behavior. In other words, they mistakenly believe that “pit bull” dogs are specially and consistently different from all other dogs, but are all similar to each other. With an abundance of misinformation about “pit bull” dogs in circulation that suggest “pit bulls” are unique and uniform in their behavior, it’s no wonder that the public incorrectly believes that “pit bull” dogs need to be regulated. However, we know that it is impossible to accurately predict behavior based on breed or physical appearance alone. Every dog is an individual whose behavior is a result of many factors, such as training, socialization, breeding, environment, genetics, and management. And yet, many continue to believe that physical appearance and breed alone are enough to make judgments about a dog’s suitability for adoption, insurance, or inclusion in our communities. We know this isn’t true. 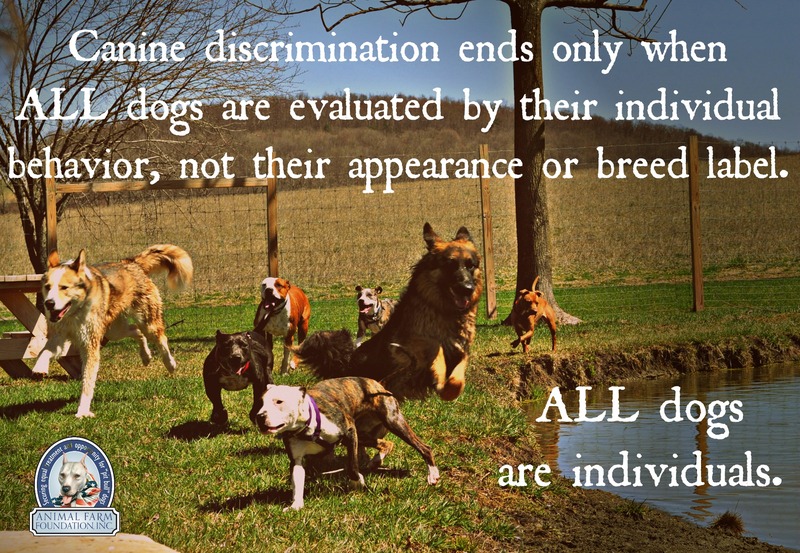 We know this myth has led to discrimination and unfair treatment for “pit bull” dogs. Despite the many differences in approaches by various “pit bull” dog advocates and animal welfare organizations, we can all agree that we want the dogs to be treated fairly. We want “pit bull” dogs to be judged on their individual behavior and our individual behavior as owners. We want the discrimination to stop. That’s why it’s so important that we consider how we share information about the dogs. Our sweeping generalizations lead to their sweeping restrictions. In our work with lawmakers who are considering breed specific legislation we’ve discovered that “pit bull” dog supporters have inadvertently provided fodder to the pro- BSL argument by suggesting that “pit bull” dogs have unique capabilities and traits, unlike any other dogs, and that they all require specialized, skilled handling in order to keep others safe. Going forward, we must help lawmakers and the public, including “pit bull” dog owners, understand that there is no canine behavior trait that is unique to one kind of dog or uniformly guaranteed in its presentation among dogs of any one breed. If we want dogs to be treated fairly, as individuals, we must discuss them as individuals. That’s the only way to stop the discrimination. There is NO single behavior trait that is unique to “pit bull” dogs only. There is no such thing as a guarantee when it comes to breed traits. Not in pure breed or mixed breed dogs. Sweeping generalizations lead to sweeping restrictions. Remember that dogs are individuals first! This is a trait that is not unique to “pit bull” dogs. There are other breeds of dogs where an intolerance for or sensitivity towards other dogs may be considered breed standard. Additionally, behaviors are complex traits, influenced by a number of outside factors (socialization, training, environment, etc.) which means dog-dog tolerance levels are an individual trait in any dog – no matter what breed or breed mix they may be. This is a trait that is not guaranteed in “pit bull” dogs. Breed traits are possible, but never guaranteed. This is especially true for any dog that is a mixed breed dog. Once a dog is a mixed breed, all bets are off in terms of how breed traits present themselves in a dog. The majority of dogs being labeled “pit bull” today are not from a closed gene pool and breed traits do not apply. However, even if we are talking about pure breed dogs, we still know that breed traits are possible, but not guaranteed. When breeding dogs for a purpose (such as Greyhounds for racing) even the strictest, most ruthless breeding for a specific trait can only increase the likelihood of a behavior to a certain point, but it cannot guarantee it. The majority of “pit bull” dogs today are not being bred strictly or for purpose. With those two points in mind – “pit bull” dogs are not unique from all other dogs, nor are they uniformly the same as all the other dogs labeled “pit bull” – we can instead rely on providing solid resources that teach the public how to be responsible dog owners. Never leave children unattended with dogs. If you have multiple pets, supervise their interactions. Consider keeping your pets separated when you are not at home. If you’re not comfortable leaving dogs loose together, we recommend using baby gates or crating and rotating them. Observe your dogs around high value items. If they guard toys or food, consider removing those items or separating pets while those items are being enjoyed. Give each pet a separate area to eat their meals. Follow leash laws and properly manage your dogs at all time. Do not let dogs roam loose in your neighborhood. Check your fences for gaps or damaged spots that may allow them to escape. Create positive interactions with other dogs by carefully choosing who your dogs socialize with in public. 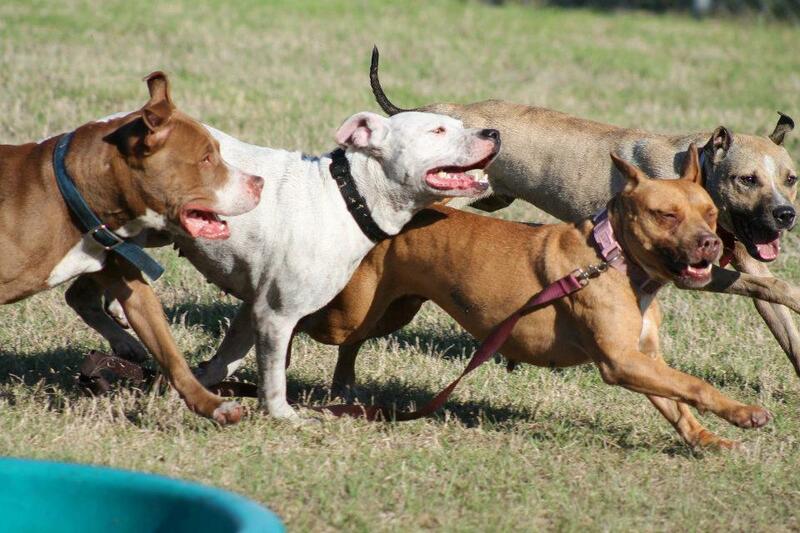 Research dog parks to decide if they’re the right fit for your dogs. Some dogs have unpleasant interactions with dogs at parks. You’ll likely encounter dogs with varying social skills and training. Get to know your dog’s needs. Not all dogs are comfortable socializing with unfamiliar dogs. Rather than ignoring your dog’s individual dog tolerance levels, tune in and make better choices. Training classes, parallel leash walks, and private play groups are all excellent ways to socialize your dogs safely. Did you notice that none of the above tips are specific to “pit bull” dogs? We don’t have to come up with different advice or warnings about “pit bull” dogs in order to help their families make good, responsible choices on their behalves. 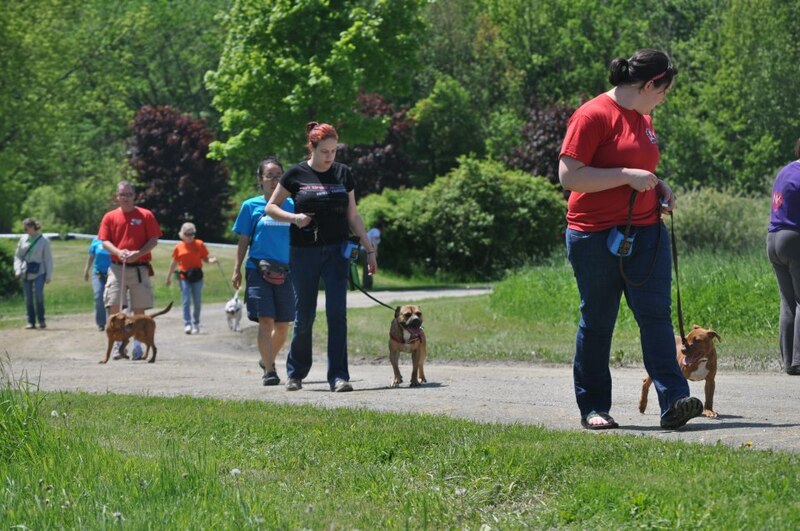 Many dogs benefit from structured socialization, such as group walks. What’s good for dogs is good for “pit bull” dogs and vice versa. If you’re an advocate or rescue and you put these tips on your “pit bull” specific website, they will automatically become advice about “pit bull” dogs and speak directly to the people who are looking for advice about their “pit bull” dogs. You’ll be reaching your target audience just by putting this solid advice on your pit bull-specific website. We’re using this as an example, because we want to make this part clear: Go ahead and discuss responsible ownership, the importance of training, management, and smart socialization, but stop framing “pit bull” dogs as if they are unique in their needs for these things. Because when we do that, we perpetuate the myth that “pit bull” dogs are uniquely and uniformly deviant from all other dogs. And it’s this perceived deviance that leads to discrimination. If we want safe communities, better adoption matches, and less discrimination, then we would do best if we focused on teaching the public about general dog behavior, training, socialization, and responsible ownership – for ALL dogs. Remember that overall dogs – pure breed or mixed breed – are more alike each other than they are different. For example, loyalty, athleticism, and affection towards humans are qualities that exist in many dogs. Selectiveness with other animals, stubbornness, and tenacity are qualities that exist in many dog breeds as well. Pure breed traits exist of course, but there’s no single trait that is unique to or guaranteed in one breed of dog. Please note: When determining what’s right for your own personal dogs, be honest about who your dog is and meet your dog’s needs. You are the expert on your own dog! If they don’t like something or you’re not comfortable trying something with them, please don’t do it. On the other hand, what’s true about your own dog and their needs isn’t a fact about the needs of all dogs that look the same way as your dog. Be confident in understanding what makes your dog unique, but without implying that “pit bull” dogs are unique from all other dogs. For whatever traits we may observe, in our own dogs or others, in the end every single dog is an individual. All dogs must be evaluated – for the adoption floor, for an insurance policy, or for restrictions within a community – based on their observed individual behavior, not on breed or appearance or predictions based on either of those things. We can secure fair treatment for the dogs and their families only when we promote this basic truth: All dogs are individuals first and foremost. This individual-first approach is born out of our decades of experience with the dogs themselves – from family pets to fight bust dogs. We have learned time and again that “pit bull” dogs are not uniquely different or uniformly in need of specialized skills, a certain type of home, or experienced owners. Dr. Alexandra Horowitz of the Dog Cognition Lab writes, “… breed standards include personality descriptions. Unfortunately, personality is not genetically determined: just as a person’s personality derives from more than her genome, a dog is not merchandise whose behavior (outside of a few hard-wired ones, like pointing) can be predicted ahead of time. While many owners may see breed-typical personalities in their dogs (we humans do tend to spot just the evidence which supports our theories), there is simply no guarantee that a dog will behave just so. Witness the cases of cloned — genetically identical — pets who have, to their owners’ great surprise, quite different personalities. Thus, inadvertently, breed standards lead potential adopters to treat them more like products with reliable features. If we all want to achieve our common goal – fair treatment for “pit bull” dogs and an end to canine discrimination – we have to move forward into recognizing all dogs are individuals. We can stop proponents of breed discrimination by ripping the false rug of “pit bull” dog uniformity and uniqueness out from under their feet. We can teach them to be accurate in their assessments by choosing to evaluate all dogs based on their observed individual behavior and the behavior of their owners. Our words have power. They reach far beyond our targeted audience of potential adopters and families. They reach into law books and shelter policies too. The dogs are counting on us to advocate for them in such a way that does not cause more harm than good. They are counting on us to stop mythologizing them – for good or bad – and start seeing them as individuals. Good read, need this spread public ally and to political levels before the BSL LAWS ARE IMPLEMENTED. We wer given a chance to adopt and love a pit / lb mix little girl.She was tied to a sumperster in 101* weather, our neighbor found her and fed her and gave her tons of water all day while he works. Then he bourhgt herhome and could not keep her. My husband [ due to all the lies floating arounf out there about pitbulls ]was reluctant at first and I cried an cried beggin him not to let her go where she would be euthanized fo being a pit / lab mix – TAWNY MARIE havs been with us now just over 2 yrs. she is the LOVE or ouf lives and such a wonderful little girl. WE LOVE OUT PIT ? LAB mixed puppy..GLAD SHE PROVED THE RUMORS WRONG. Even more to the point: Most “pit bull” bans include three or more registered purebreds and any mutt that may resemble them in the mind of a non-expert. So how is it that three to five different breeds behave in the same way and even more ridiculous, that all short-haired medium-sized mutts, whose ancestry is not and cannot be known, also behave in the same way? Yet supposedly, no other breeds or mixes exhibit similar behaviours, most of which are identical in all dogs, regardless of breed. Especially today, when conformation dogs are bred for looks, to say that any types of modified drives exist in any show/pet breeds shows a lack of understanding of genetics and of what breed actually means. And of course BSL always begs the question: If all these “pit bulls”, however you define them, are such hard-wired, rootin’, tootin’ bad guys, why do so few of them exhibit those types of drives? They are, after all, one of the most popular types of dogs in the US. It’s all malarkey because the agenda has little to do with dogs and everything to do with eroding civil liberties using dogs as a tool.